Every house is built on a foundation, but not every house is built on the same type of foundation. Foundation type is based on several factors, such as the house design, the geographical location and climate, soil and moisture conditions, and the project budget. But chances are your house has (or will have) one of these three foundations: full basement, crawlspace, or slab-on-grade. Other variations are possible, but these three are the main types that you will encounter in residential construction. The primary advantage a full basement is all the extra space that it gives you. In some homes, finishing a full basement can nearly double the home's living space. A full basement can be conditioned (heated or cooled) like the rest of the house, or it can be unconditioned. A full basement consists of structural foundation walls that bear on foundation footings running along the perimeter of the basement. Footings usually extend below the frost line, the depth to which the ground freezes in winter. One functional variation of the full basement is the daylight basement. Built against a slope, the daylight basement has one or more sides that are completely embedded in the ground, from floor to ceiling. However, as the slope descends, one or more sides of the foundation are exposed and can have large windows and doors, which bring in daylight. Basement foundations in modern homes are made with poured concrete or mortared concrete block. Very old homes may have full (but usually small and short) basements with stone walls. Foundations that create a crawlspace consist of short foundation walls that stand on footings. The walls may be very short—creating a space that you literally have to crawl (or belly crawl) through—or they can be four feet tall, or so, providing enough room for storage and sometimes a furnace or other equipment. Typically, crawlspaces are unheated spaces and may be ventilated with small vents that penetrate the foundation walls to promote a small amount of airflow through the crawlspace. Crawlspace foundations are less expensive than full basements because they require less excavation and less foundation wall material and labor to build. Like full basement foundations, crawlspace walls typically are made with poured concrete or mortared concrete block. A slab-on-grade foundation is a solid-concrete slab that rests on the ground. Grade refers to ground-level, and slab refers to the monolithic concrete pad. Slab-on-grade foundations are most commonly used in climates that do not experience ground freezing and thawing, as this can lead to cracks in the concrete and shifting of the foundation. 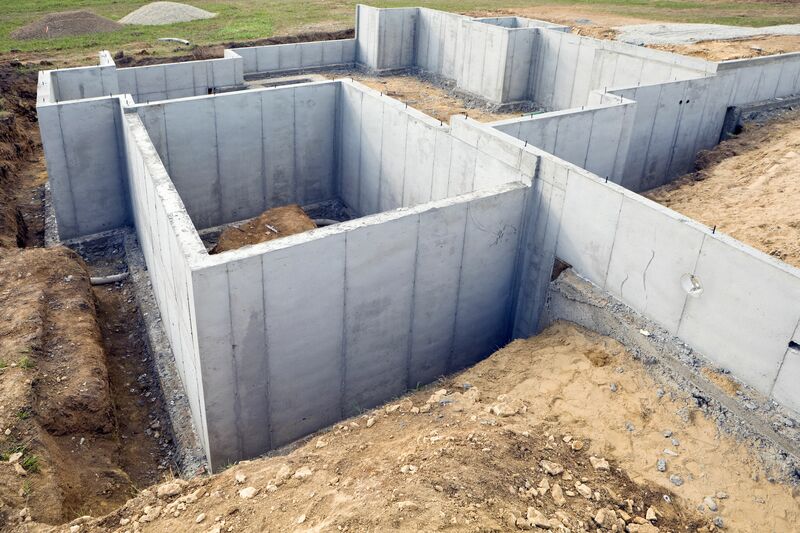 Slab-on-grade foundations tend to be less expensive than the subgrade (full basement or crawlspace) foundations and can offer better protection against termite infestation (also common in warmer climates). One notable downside of slab foundations is that water supply and drainage pipes are encased in the concrete. In the event of a problem, the concrete slab must be cut into to access the pipes. Also, slab foundations offer no storage or living space.